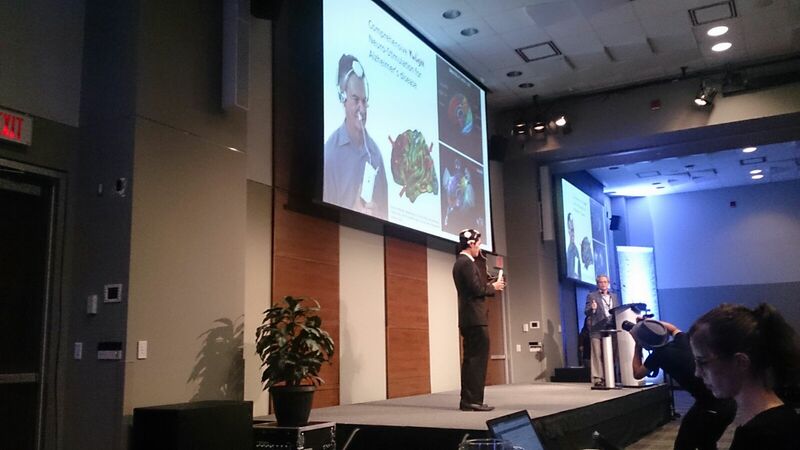 9:35AM: WT | Wearable Technologies CEO Christian Stammel introduces the WT | Wearable Technologies Conference 2015 CANADA. We are looking forward to an inspirational event. Thank you MaRS for helping us to organize our first Canadian event. Some big trends are bubbling at the moment: Analog Watches with Smartphone functions which have a more attractive design and longer battery life. Pimptech VS Shytech. Do consumers want to show off their wearable or wear it secretly, e.g. as a patch? Battery life is another technological feature to keep in mind – there are many new solutions and ideas on the market – which ones will guide the way to the future for wearables? 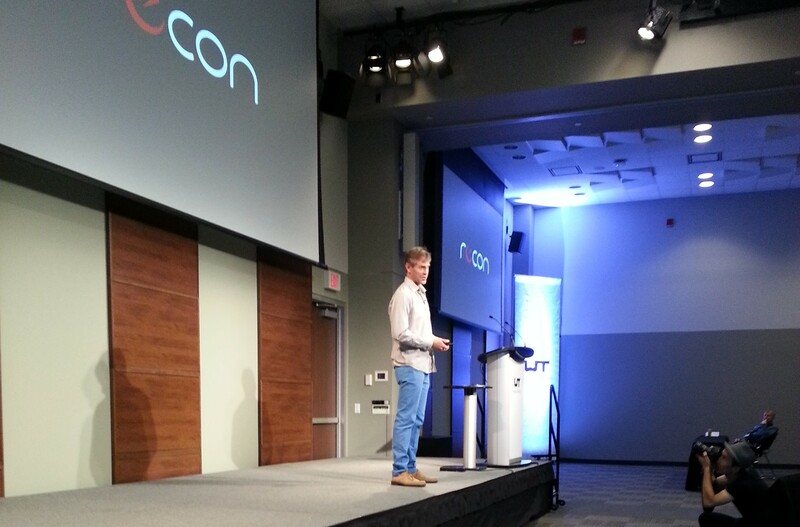 9:47AM: Tom Fowler from Recon Instruments introduces their awesome smart glasses for athletes. He already presented several Recon devices at our WT | Wearable Technologies Conference EUROPE, four years ago. Now, Mr. Fowler shares his experiences with the WT | Wearable Technologies Innovation World Cup. Mr. Fowler shows what us what is needed to bring a startup to success. In summary he states, “You need passion and a strong belief in what you are doing / your product. Mentorship is extremely important – either to see you succeed or fail. Mentors help you by protecting you from yourself. Criticism can save your project’s life. Spectacular salesmanship is absolutely necessary to sell your dream to partners and customers – be a magnet for talent and employees, investors, tech partners,… You better have someone in your team who can help you to transport your idea into the world.” For Intel, Recon was a small acquisition; but for Recon it was huge success that changed the life of the entire team. Mr. Fowler touches on how the wearable space will overtake the mobile space within only a few years’ time; thus, one of the reasons why Intel acquired them. The second reason is computing is a very important issue that needs wise people to work on future solutions. 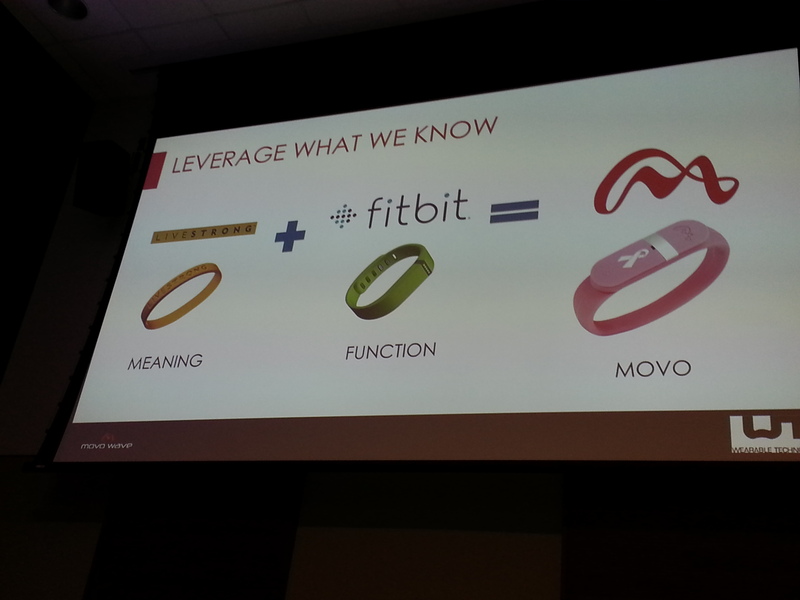 Future of wearables is to ask yourself if you are able to cross over into different segments (he refers to Christian’s introduction about medical products that will not have the medical look anymore, and that many companies from activity tracking market will become interested in entering the healthcare market). Crossing into this stage is perfect if you only need tiny adjustments to your product. There are two traps that can cut your wearable story short. One, shiny object syndrome – so they spent a lot of money and time to cooperate with a big brand but nothing comes out of it. Mr. Fowler recommends to stick to your core business and do not get distracted. To think that your work is all about making the world’s money is not true. You have to spend money to go forward. 10:24AM: Our Enabling Tech panel starts under the theme Wireless Power. Colin McCarthy, Sales Engineer, representing WiTricity, will present how they enable the next-generation of wearable devices. With WiTricity technology you can power multiple devices from the same wireless charging field. Their electromagnetic coil extends power even further. In the future you can simply place any laptop on the table and it charge automatically. Communication will take place via Bluetooth of WiFi. The predicted market for wireless powered systems is 15 billion dollars by 2024. Some examples are presented from WiTricity partners: Merriot wireless charging power bank. An example of WiTricity’s several charging cases for the automotive sector; such as wireless “park and charge” where EV’s and HEV’s are charged wirelessly. WiTricity technology is comparable to plug-in energy transfer efficiency. Another application for wireless charging is in the medical market, e.g. for implants in the body. Wearables need to improve their ease of use for the consumer. With WiTricity you can charge several objects at the same time; much easier than connecting small packs physically. 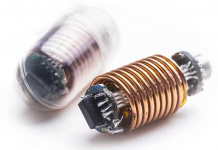 The electromagnetic coils are extremely small, thin and flexible. Considerations for future wireless charging improvements are the power transfer distance and efficiency related to the size of the resonator. Form factor and coil size have an influence on the transferred power limit and how much power can you drive in a devices without heating it up too much. 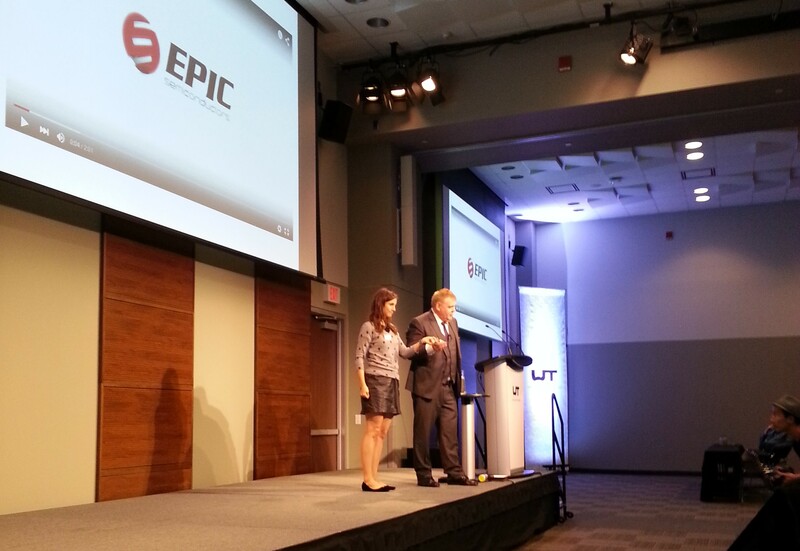 11:08 AM: We are happy to welcome our partner Flex to the stage at the WT | conference in Toronto. 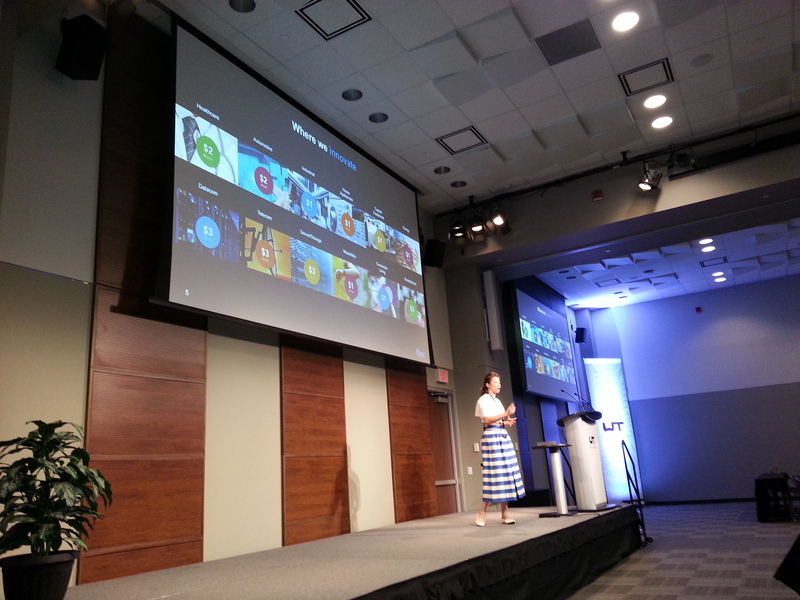 Cindy Soo explains how Flex can help you to manufacture your device and make it real. Innovation is the engine of differentiation and the driver of success! More than 23 Flex devices were release by the end of last year. About 15 million devices were shipped (most activity trackers). They know the insights on where consumers want to spend their money; but are not able to get in touch with them. Flex understands the trends, the technology and can give you valued support with their knowledge. There is a movement into the body because it’s convenient, invisible, and comfortable. According to Cindy emotion is what is missing for many wearables – that’s why they do not last on the market for a long time. That’s what we have to create; but it is difficult because it’s not tangible. With Flex brand loyalty is guaranteed. 11:20 Coffee Break – enjoy some brain food provided by Presidential Gourmet Catering. Attendees are also invited to walk around the exhibiting area to talk to our exhibitors. 12:00: Sonia Strimban, representing our event partner MaRS, moderates our Canada Special. She explains how MaRS can help to commercialize your brand and assist with going to mass market. 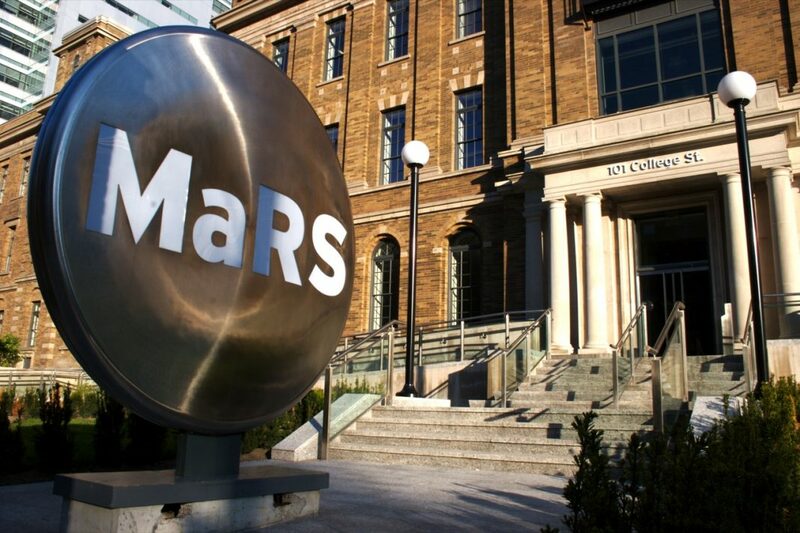 Thank you to MaRS for hosting our event in Toronto for the first time. 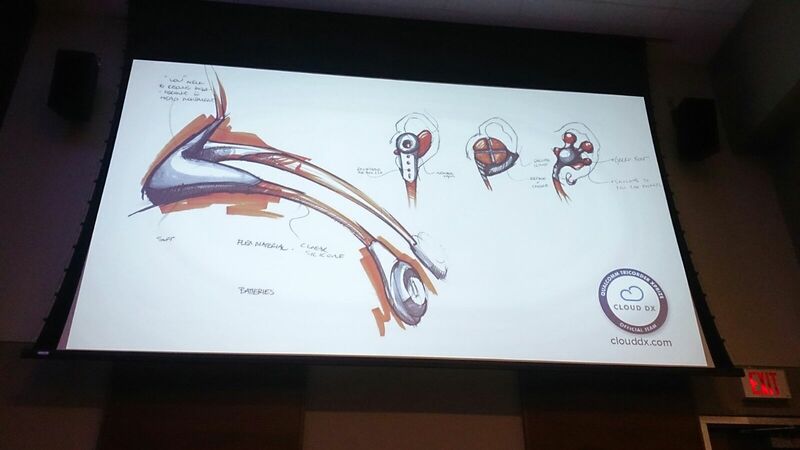 Ashlyn Bird from Biosensive Technologies presents EarOSmart- an earable which monitors heart rate, activity, and calories in a highly fashionable way. 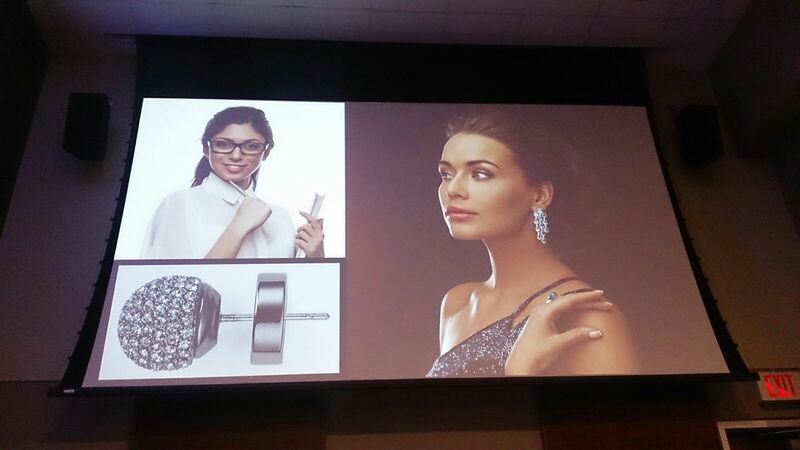 She also announces their new product design, which is even smaller, more fashionable, and unobtrusive! It will be available on the market this October, so keep your eyes open for this fashionable wearable activity tracker! Dylan Horvath from Cloud DX comes to the stage. He will present their multi-function virtual medical device and cloud diagnostics: Vitaliti. It consists of wearable sensors to record vital sign, and monitor the body. Vitaliti is essentially a wireless spirotoscope, made into a vitro diagnostic system, and pulsewave health station. The necklace can measure heart rate, temperature, respiration rate, oxygen saturation, blood pressure, exercise zones, core body temperature, steps, calories, posture, sleep cycles, plus more! The necklace is appealing and easy to use for everyone. GestureLogic, creators of LEO, presents Michael Kravshik on stage. Mr. Kravshik explains how their device can revolutionize the way we train with EMG. He states that for consumers it’s about price and size. Therefore, GestureLogic shrunk their device and made it available for $300. Get intuitive and actionable biofeedback with LEO. 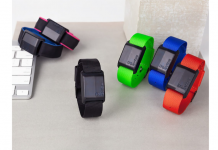 Wearables for Kids: presented by Lyssa Neel, Ph.D. Founder and CEO of Linkitz Systems: Children want to take adult roles, while adults want child to emmerse themselves in STEM learning. Linkitz is the solution! It’s not sold specifically for girls, but it was designed as a wearable that can motivate girls into the computer world. Linkitz is a codeable friendship bracelet that creates excitement about technology and coding. It’s very important to be playful but at the same time educational. Let Kids play with technology! With this goal in mind, Linkitz has a bunch of devices in their pipeline. This product will be delivered to market in December 2015. Fight Alzheimer with the first portable transcranial-intranasal light therapy system from Vielight. Dr. Lew Lim, President & CEO, explains how it works. 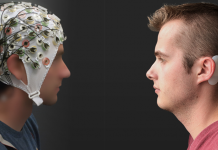 QEEG readings are recorded brain rewiring activities within 25 minutes. 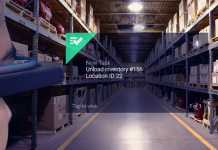 Vielight wants to make this technology simple. Based on case studies they wanted to improve and make the devices more convenient. Mobile VR – The Key to Virtual Reality for the Masses; is presented by Vlad Dascalu – Director of Marketing, Pinch VR. Their VR device unfolds into a virtual reality headset for the middle consumer category based on the idea: the best camera is the one that is with you. Ollinfit monitors & corrects your form in real-time, to maximize your results & minimize your risk of injury. Hani Abidi explains how the device works and how the company came up with the idea. Trainables are a huge topic. This is because most people have a busy schedule, causing a lack of time and no will to hire a personal trainer. Ollinfit thought that there must be a different way to get the public motivated and fit! There are lots of wearables on the market that lack the ability to train people effectively and independently. You need a trainable to maximize result, and minimize injuries. Ollinfit can tell you how to correct your form. OLCt 5th kickstarter & WT Gadget of the Month September 2015. Enhancing the Human Experience with Augmented and Virtual Reality: Kibaya Njenga, Project Manager and Founding Team Member from Sulon Technologies. Mr. Njenga tells us why the Cortex is so unique compared to the other devices out there. The Cortex is completely wireless so you do not need any laptop or anything other smart device. Your body is the machine and the camera. 12:40: Enjoy the delicious Lunch Break. Thanks to Red Bull Canada for providing free cans for our exhibitors and to Cote & Ciel for the beautiful laptop cases. Go check out MediaTek Labs in our exhibition area. They are the ultimate development platforms for Wearables & IoT. Think it, build it, code it — MediaTek LinkIt™. Their portfolio of development platforms for Wearables and Internet of Things (IoT) is professional and clear. MediaTek offers chipsets or modules the ideal platforms to a broad range of connectivity options, and the development tools needed to create your own devices! Use the extended lunch break to talk to WT | exhibitors. TÜV SÜD is the specialist for testing and certification solutions for wearables. Find out more by chatting to them at their booth. You should also talk to their partners from Global EMC Labs offering EMC, Wireless, Laser/LED & Product Safety testing to FCC, CE, CSA/UL/TUV standards. We also have a few healthcare companies exhibiting with us today. We are happy to welcome Cloud DX again with their FDA approved healthcare device. Vielight presents the first portable transcranial-intranasal light therapy system for Alzheimer patients. Ollinfit showcases their device allowing personal training for everyone. Head over to talk to them about how to have a successful Kickstarter campaign. We are happy to have PinchVR on-site offering an immersive virtual reality experience – with your phone. Preorder for $99. After their talk in the Canada special, you can also have a look at Linkitz‘s smart toys motivating girls to become excited about coding and technology. If you need a rest, you should try Muse in our exhibition area! Find out first hand if their meditation headset really works. Magniware is a fusion of hardware, software, and advanced material science. It is a wearable device capable of accurately collecting and analyzing physiological data. Were you wondering how to help improving the health and performance of your beloved horse? Finally you can with SeeHorse! Check out how it works by stopping at their booth. 2:00 PM: We resume the WT | Canadian conference with Jocelyn Dunn, Chief Scientist, HI-SEAS Mission III. Ms. Dunn demonstrates to the audience the opportunities available for wearables in space. HI-SEAS is planning for a Mars expedition. Within the past 8 months, Ms. Dunn has been living on a “fake Mars” at a station in Hawaii, USA. A mars mission takes about 3 years, so there are many factors you have to take into account for an extreme expedition. Emotional and health states must be regularly tracked to ensure the safety of astronauts. 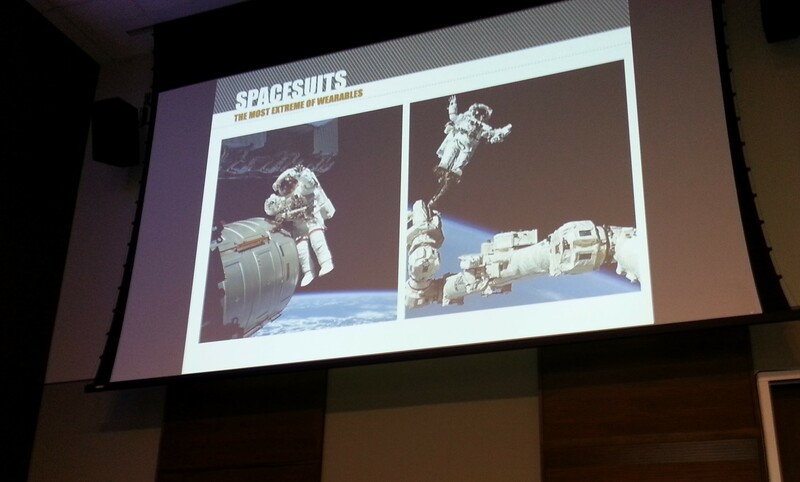 Spacesuits: the most extreme form of wearables. Ms. Dunn explains how her spacesuit can monitor astronaut behavior, health and performance, and add augmented sensory experiences. 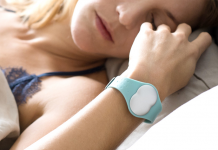 There are several wearable gadgets that assist with emotional sickness, and provide solutions to overcome the symptoms. The spacesuit also has devices to monitor sleep, activity, physiology, and environment. There are also loads of devices available for human-human, human-machine, multimodal interaction and mounted displays. Enhancement can be both physical (e.g. with exoskeletons) but also a sensory experience (astronauts get deficiencies for smelling for example when in space for a longer period). What is stress? How do people experience stress? It’s completely individual, and at times very emotional. Is there a physical basis on how to detect stress, in order to help to fight against it? Stress starts with the internal or external stressor; you go to the “fight or flight mode” and produce stress hormones. There are physiological, environmental (traffic jams, pollution), emotional (anger, social conflict) and behavioral (smoking, lack of sleeping) kinds of stress. So what are the most stressful parts in space? A) The social situation because you cannot run and are “locked” with the same persons for an extremely long time. 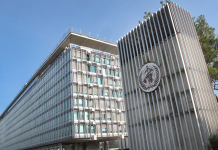 B) Resource limitations: no markets or online shopping in space. C) Food restrictions because it’s simply not possible to get everything in space, you can risk running out of certain supplies D) Communication delay: it’s not a real conversation but a one-way communication. 5) Lack of Privacy: you do not have your own rooms (besides a super tiny bed); no gossip possible. HI-SEAS stress research team used the Hexoskin shirt to collect biometric data, and Jawbone UP wristband data for activity tracking. All data collected was used for stress research to find out how those types of stress have an influence on people’s behavior and what can be done to avoid them. 2:41 PM: Tom Emrich, Founder of WeAreWearables, the largest wearables community, moderates our session: “Best in Class Products and New Areas of Application”. WeAreWearables meets on a monthly basis. The biggest wearable community is in Toronto, but there are several other hotspots to meet. 2:45 PM: Mark Tanner, CEO & Founder, Movo explains how they make their product simple, stylish and affordable. Their first product measures activity, calories burnt and distance travelled for only $29,99. Promoting a healthy lifestyle for all people! How did they do it? Scale volume. The device is fully customizable for anyone and they are happy with their partners, e.g. for health programs in companies for employees. 3:05 PM: Brian Wynne presents SharkStopper, the World’s First and Only Acoustic Shark Repellent. The device generates a specific underwater acoustic sound through the use of a watertight and self-contained electronic package. The device reminds you when you are running out of battery- to get out of the water in time. There is a 150 billion dollar business to fight against sharks. SHarkStopper does the job without hurting the other fishes; it only repels sharks. SharkStopper is looking for investors. So don’t hesitate to get in touch with Brian if you want to swim carelessly in the ocean. uBirds‘ Paweł Karczewsk shows us how they connect Tradition and Innovation with their wearable device. In the 18th century, the Swiss invented the automatic movement which changed the watch market. People who adore watches search for quality and handicraft. That’s why the Swiss watch market survived for so long, and will also survive the smartwatch area. Most people buy watches to express themselves, their style and personality – and to know the current time and date. It’s about social status. But of course there are also have sentimental values to wearing a watch. Benefits of smartwatches are the digital features. For classic watches, it’s their design and handmade work. There is an emotional binding that uBirds works to connect the benefits of analog and digital. They came up with the smart strap transforming any watch into a smartwatch. Their Kickstarter campaign starts on September 22. 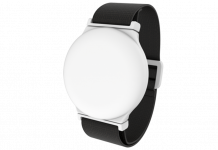 The handmade “smart straps” have NFC tags for gesture recognition, activity tracking, contactless payments, and much more. Battery life is three days- at the moment. Shipping will start in March 2016. 3:33 PM: John D. Ralston, CEO, X2 Biosystems: Advances in Wearables Sensors for Head Impact Monitoring and Concussion Risk Assessment in Athletic, Military, and Industrial Environments. $80 Billion estimated annual costs of concussions in the US (2010, direct medical costs, loss of productivity). In addition, about 4,000,000 sports-related concussions diagnosed reported each year in the US, plus more that go undiagnosed. The US introduced special safety laws to decrease the risk of injuries. The company had the “Hammerhead” Mouth Guard prototype ready in 2012 and since then worked on the X-Patch. Their patch is located on the spot behind the ear- an ideal location to measure impacts. A helmet often moves differently from the wearer’s head. Challenge: accuracy, sensitivity, reproducibility to analyze complex dynamics and concussion injury risks. There must be convenient software and user interface available, low cost production. If you have not already talked to our exhibitors, you should take time to do so. 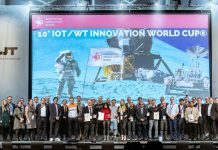 Meet TÜV SÜD for their testing and certification solutions for wearables. PinchVR was not only on stage but is also showcasing their device to transform your smartphone into a VR device. You can pre-order their device for $99. You can also pre-order Linkitz, the smart toy for kids to gain interest in coding and technology. 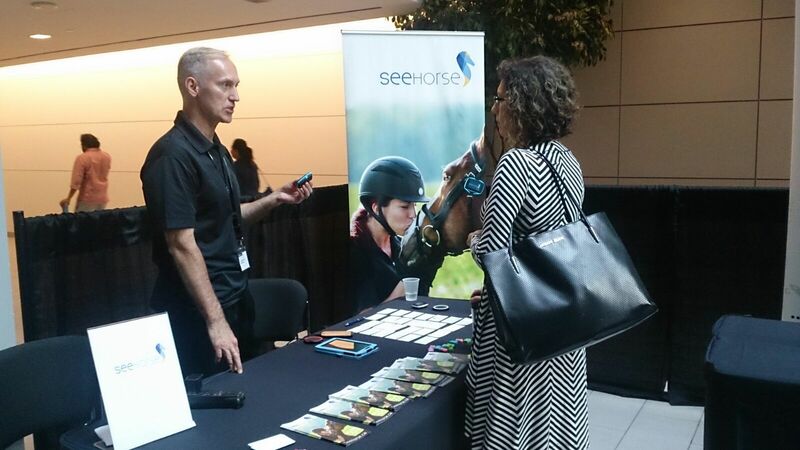 SeeHorse measures the activity and vital signs of your horse and help to improve the health and performance. 4:19 PM: Let’s meet the Greater Ecosystem and Beyond. Andreas Freitag, President / CEO of Cobi of America, iCradle steps on stage to speak about smart and connected bikes. 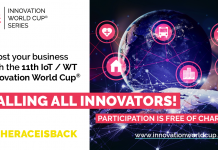 The company was finalist of the WT | Wearable Technologies Innovation World Cup 2015. So what is their product about? They jumped on the trend of smartphone connected mobility; since then they began to focus their customer base to bicycle enthusiasts. Cobi of America came up with the great idea to translate those tech trends to the bike. One big challenge: Battery life; especially when using GPS. Cobi provides one integrated system. iCradle can be used for all bikes, it does not matter if old or new. There are dynamic lights, break lights, motion sensing, loudspeakers, and navigation. It also features several safety functions; theft alarm, battery charging, all wireless, easy to install. iCradle is a tech hub on your bike. 4:38 PM: Ben S. Cooper speaks about fashion tech. He is Senior Manager, Research & Testing from VF Corporation’s Global Innovation Center (e.g. roof of Wrangler and Timbaland). What’s the idea of fashion? What’s the idea of technology? He states, “To combine the two it is a challenge.” Fashion and the digital world are two different worlds. They are composed of different materials, different manufacturing processes, different supply chains, different scaling, even the business models are not the same. 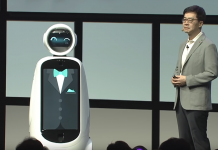 Engineers have to consider customer interaction; but what ties these two worlds together? The same consumer! There are hurdles such as size, power demands, sensing, connectivity, laundering, and fit (70% of comfort is defined by fit!). It’s the emotion you cannot necessarily provide via function. According to Ben, the keys to greatness are: 1) solve a consumer problem, 2) put an emphasis on design, 3) offer a differentiating user experience, 4) be reliable, 5) reduce consumer friction, 6) simple, seamless, and integrated, 7) collaborate from the beginning. Talk to VF Corp, they are looking for solutions and partners to realize new ideas and realizations to merge fashion and tech. 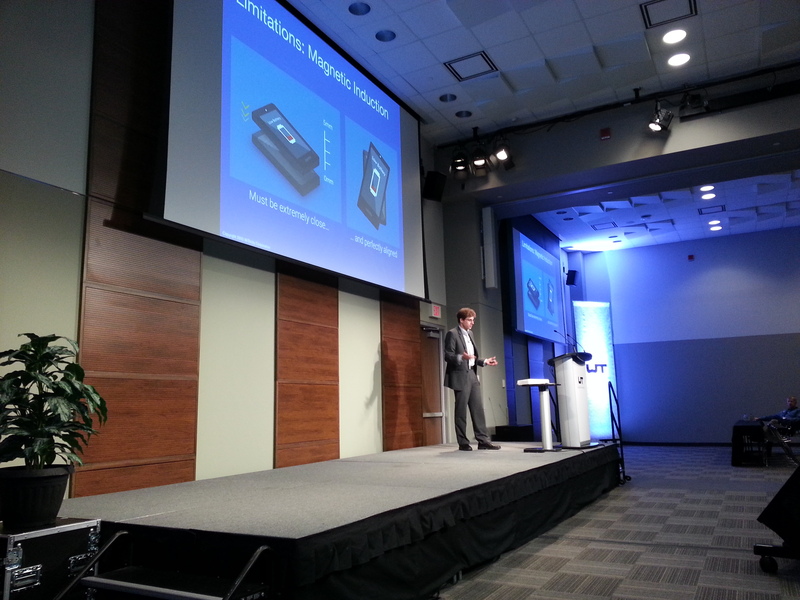 5:00 PM: We are happy to welcome Best Buy Canada, one of the major distributors of wearables at the moment to the stage. Zayn Jaffer, Director of Merchandising & Emerging Business, explains their approach to wearables. The main problem is: consumers do not know how to use wearable devices. So Best Buy partnered with their distribution partners to demo the products, let the people try (e.g. help them pair the devices with their smartphones). 5:20 PM: Chris MacDonald, Sales Manager, TÜV SÜD, shows us how they can make people’s life easier and products safer. If you create a wearable device, you have to be aware that there are baseline standards depending on the intended use / market (e.g. for skin / eye contact, acoustic sound pressure, absorption rates,…). Also important: what accessories do you have? What additional testing / certification do they need? Is your supplier documentation reliable and complete? Have you checked the product quality? How often will you examine production quality? Consumers are increasingly aware of social compliant factories – make sure your company is up to standards! In the future the market will change and this means that also the standards will change. 5:30 PM: The conference is over. We hope you enjoyed the event. Now grab a beer and use our after-conference-get-together to network and discuss your thoughts. See you in a bit.